Happy Kitchen Sink Stamps Monday, thanks so much for stopping by! I don't do a lot of Clean and Simple stamping, I'm more of a technique/layer type of stamper, but today I've got a really CAS Wedding card to share. Basic Grey makes it so easy to add just a sentiment and a few embellishments to make quick CAS cards. 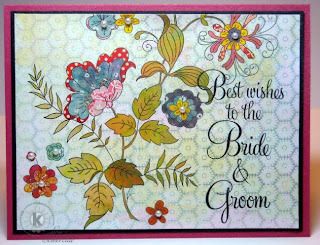 I found this wonderful pattern in the June Bug Collection, and added the sentiment from Kitchen Sink Stamps Multi Step Wedding Rings To embellish my card, I added a few Basic Grey Pearls. After assembling my card, I sprtiz the entire piece with Pearl Glimmer Mist. This sure makes a beautiful card! So beautiful, Lisa! For some reason I really like CAS wedding and anniversary cards and this is no exception...beautiful!! Fabulous wedding card with this beautiful BasicGrey paper and sensational KSS sentiment!! Simply gorgeous!! Wonderful design, Lisa!! Wow!! Lisa, I didn't expect CAS style from you but it is absolutely beautiful!! Fantastic job! You do CAS so incredibly well! I just love everything you do. Your work is beautiful. Beautiful C&S card Lisa... very elegant!!! Lovely card! Love the pairing of sentiment and paper.